The International Monetary Fund is an international organization that oversees the global financial situation of its 186 member countries. The IMF was formed with the goal of stabilizing international exchange rates and to provide financial assistance to countries that experience serious financial and economic difficulties with loans and other forms of financial aid. Tracking those economic developments on a national, regional and global basis requires an army of economists, so the IMF has a very good handle on the global financial picture. What the IMF sees in China and India impresses the heck out of it. The International Monetary Fund is now forecasting that China and India will generate 40% of the world’s growth in the next two years. Forty percent? Wow! Let me give you some perspective on how impressive that is. Twenty years ago, China and India generated just 10% of the world’s economic growth. Ten years ago, it improved to 18%. China alone will generate more growth than the entire G7 (the U.S., the U.K., Germany, France, Japan, Canada, and Italy). India will generate more growth than all the 27 countries in the European Union. China and India aren’t the only countries in Asia that are prospering. The IMF says that China, Indian, and the 10 ASEAN nations (Brunei, Cambodia, Indonesia, Laos, Malaysia, Myamar, Philippines, Singapore, Thailand, and Vietnam) will generate half the world’s growth. “By the end of 2009, output in most of Asia returned to pre-crisis levels even in those economies that were hit hardest by the crisis. After the deepest recession in recent history globally, we know that Asia is leading this global recovery,” said Anoop Singh of the International Monetary. China and India, with growth rates of 10% and 8.8% respectively, are the economic engines behind that roaring growth. The IMF isn’t alone in its enthusiasm for China. At the annual Berkshire Hathaway shareholder meeting, Warren Buffett predicted that China has many years of prosperity ahead of it. 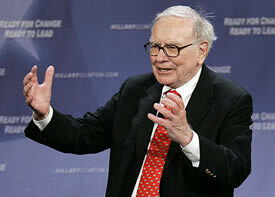 “You’ve got well over a billion people who are just beginning to realize their potential," Buffett said. Warren Buffett has joined the chorus of cheerleaders for China’s economic growth. 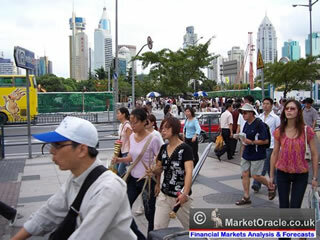 Shares FTSE/Xinhua China 25 Index (FXI): Seeks to track the performance of the FTSE/Xinhua China 25 index. This index consists of 25 companies that represent the largest 25 Chinese companies listed on the Hong Kong Stock Exchange. PowerShares Golden Dragon Halter USX China (PGJ): Seeks results that correspond to the returns of the Halter USX China index. This index consists of 103 Chinese companies whose common stock is publicly traded in the U.S. The index uses a formula that prevents the largest market-cap companies from becoming too large a component of the index. SPDR S&P China (GXC): Seeks to replicate the total return performance of the S&P/Citigroup BMI China index. This index consists of the largest 342 companies that are publicly traded and domiciled in China. However, I think you can do much better — and make a bundle — by targeting the individual companies that provide the basic building blocks of that Chinese and Indian growth. When it comes to building, nothing is more basic than cement, rebar, and wood. CEMENT: Anhui Conch Cement is the largest cement producer in China and was named as one of the “100 Top Chinese Companies with Growth Potential” by Forbes in 2006, 2007, and 2008. Anhui Conch is traded on the Hong Kong Stock under the symbol 0914.HK. REBAR: General Steel, based in Xian, China is one of the largest steel companies in China. Most steel companies produce pipes, sheet steel, and beams but 90% of General Steel’s output is rebar which is one of the most important building blocks for roads, bridges, dams, and hi-rise buildings. General Steel trades on the NYSE under the ticker GSI. Steel and cement are among the hottest commodities essential to China’s massive construction efforts. WOOD: Sino Forest is China’s largest timber company. It grows, harvests, and is also a major importer of logs. Sino Forest currently manages over 1.7 million acres timberland with options to purchase leases on an additional 2.3 million acres. Sino Forest trades both on the Toronto Stock Exchange (TRE.TO) as well as the U.S. over-the-counter market (SNOFF.PK). I’m not suggesting you rush out and buy any of the stocks right away. As always, timing is critical so you should wait for a pullback. Additionally, I have to disclose that my Asia Stock Alert subscribers already own these three companies so they already have a head start. It would be a colossal investment mistake to NOT include a healthy dose of Asian spice in your portfolio. You just can’t expect to hit any home runs if you haven’t made a significant allocation to Asia.